There was a time when train travel was luxurious and elegant—a refined way to enjoy the best things in life as beautiful view after beautiful view passed by your window. 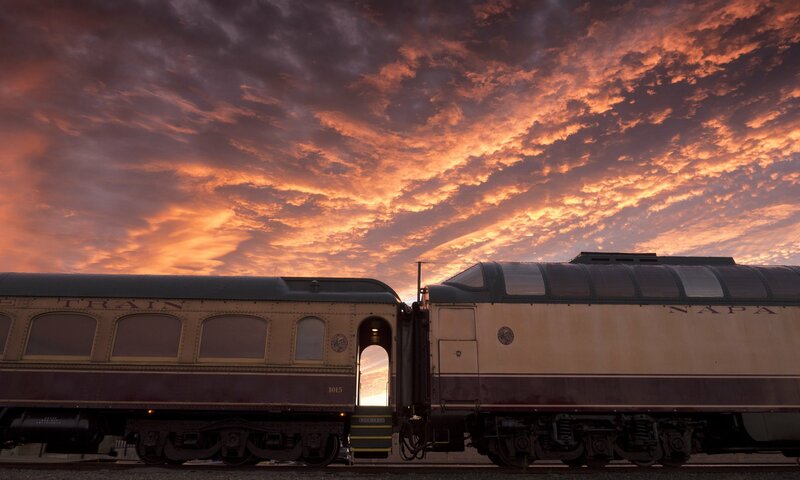 Elevate date night to the extraordinary and let yourself get wrapped up in the romance of train travel with these romantic Wine Train experiences perfect for you and your loved one. With three onboard kitchens and celebrated chefs, the Napa Valley Wine Train is more of a restaurant than a transportation vehicle. It’s also the perfect place for a dinner for two neither of you will soon forget. Our Romance on the Rails experience offers you the chance to enjoy a gourmet multi-course meal prepared by Executive Chef Donald Young complete with sparkling and Private Label wine for two served aboard a historic domed railcar. This intimate dining experience is available by reservation only and seats only 16 parties. Indulge in courses like duck confit, pan-seared Pacific halibut, and chocolate ganache tart. Declare your love with a classic gesture that future visitors to the Napa Valley Wine Train will get to see. Decorate a padlock with your initials or a special symbol and lock it to the Love Lock Bridge at the Wine Train's station. You can then toss away the key, or take it home with you as a memento of your romantic time and symbol of your enduring love in Napa. Verdant greens, rolling hills, pristine vineyards, historic grounds…is there a more romantic setting for a scenic stroll? Our tours include stops at some of Napa Valley’s most stunning and highly regarded wineries so take advantage by making time to explore these beautiful locations hand in hand. Our Estate Tour offers the perfect opportunity to spend the day exploring some gorgeous vineyards together while sampling their impressive wines, dining on gourmet dishes, and enjoying everything Napa Valley has to offer. There are few things more romantic than watching the sunset with someone you love. Make even more of an evening of romance with an after-hours tour of Grgich Hills Estate. This decadent VIP evening includes a two-hour rail journey under the stars, a multiple course gourmet dinner, and an intimate evening tour of Grgich Hills Estate. What are you waiting for? California is a dream destination for couples, and the Napa Valley provides a stunning backdrop for romance. Call 800.427.4124 to start planning your romantic Wine Train experience.